其餘為 2016 年 5 月 13 日下午 6:05 截止. The Tickets are only availabe for those who have already bought tickets for PyCon. Database with High Availability is so much important to the application reliability. The tutorial is setup to guide thru from the creation of redundant MySQL Database Instances with Group Replication. The Group of MySQL Database Instances is setup so that the data is synchronized and replicated across all database instances. 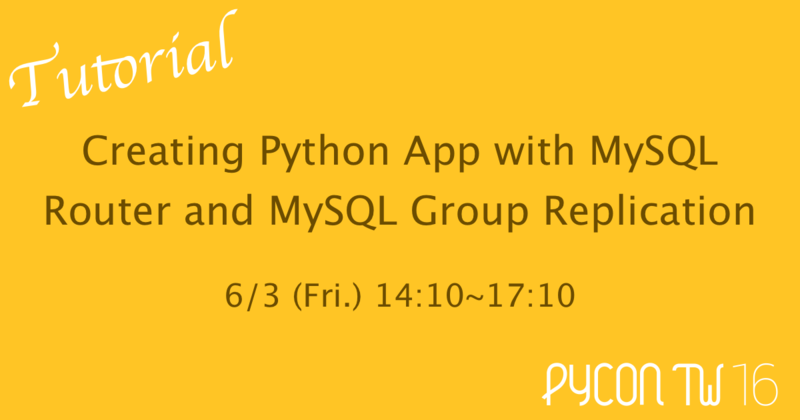 MySQL Router is setup to allow python application to connect to the group of servers without knowing the details. The Routing setup is done within the MySQL Router. He Joined MySQL responsible for pre-sales consulting, technical education &update. Prior to joining MySQL team@Oracle, he joined Oracle in System Team from Sun Mircosystems acquisition. The full tutorial shows the creation of reliable service for Python Application. Installing MySQL Database (15 mins) - Once installed, run a few test. Firstly, the VM image will be provided. Each participant is required to bring in notebook with Virtualbox installation. USB flash disk to be prepared.